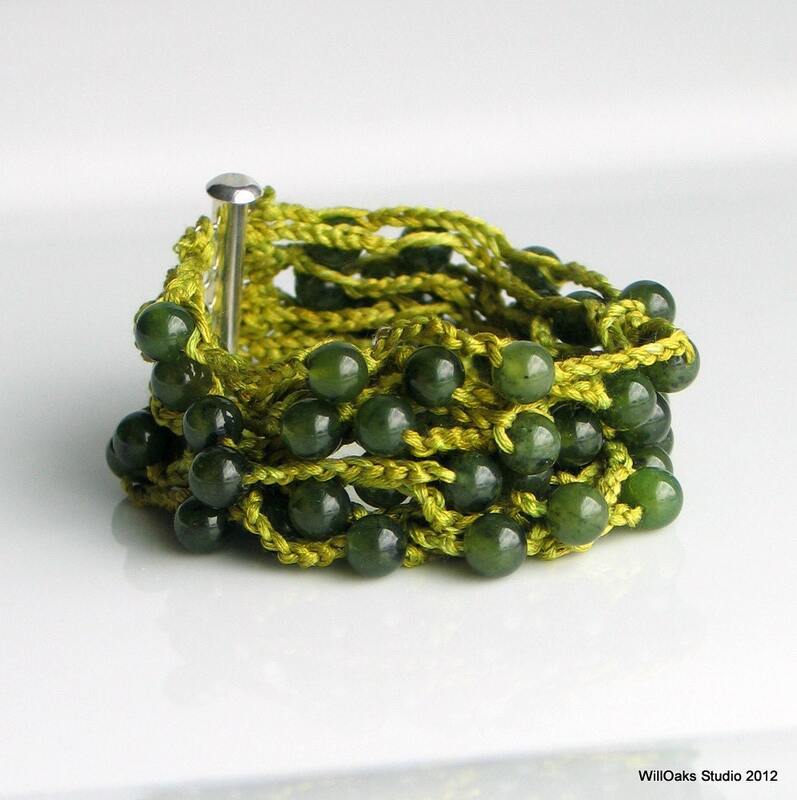 Beaded crocheted silk cuff with round stone beads of dark green dyed quartz created by WillOaks Studio. Artisan hand dyed silk captures lots of beads, each about 1/4" or 6mm, all captured along over 8 feet or about 2.5 meters of heavy hand crocheted glossy silk chain. The quartz beads have wonderful variation in subtle color differences and transparency, adding to the organic quality of the finished cuff. 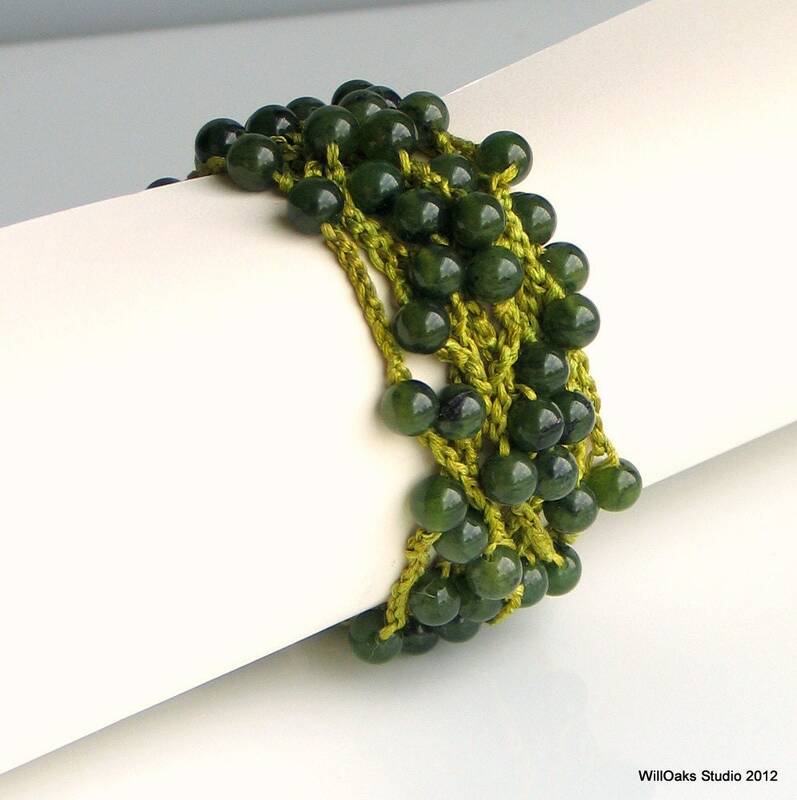 The hand dyed silk is a bright olive green that mixes in a natural, organic way with the color of the stones. My original design gently hugs the wrist in a light, soft silk cloud, closing with a silver plated two part pin clasp-the only metal used in this design. My crochet cuff pattern was included in the May 2012 Vogue Knitting Crochet Special. This artisan dyed silk fiber becomes softer and more supple with wear and is very tough and durable--so easy to put on and to forget about. Easy to care for, too, as when necessary, it may be hand washed in cold water with a gentle soap, rinsed, and laid flat to dry. And if it gets wet while you're wearing it? It will probably dry just fine right on your wrist. 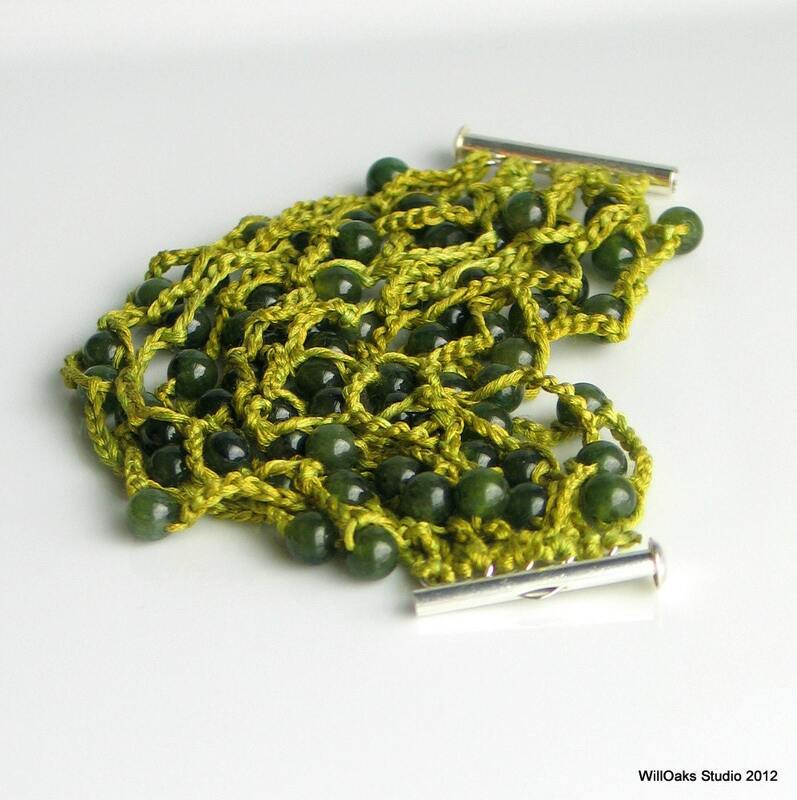 This cuff is about 7+" from clasp to clasp, but length adjustments could be made since this design is made to order. For custom sizing, put your wrist measurement in "notes to seller" and indicate "snug", "normal" or "loose." 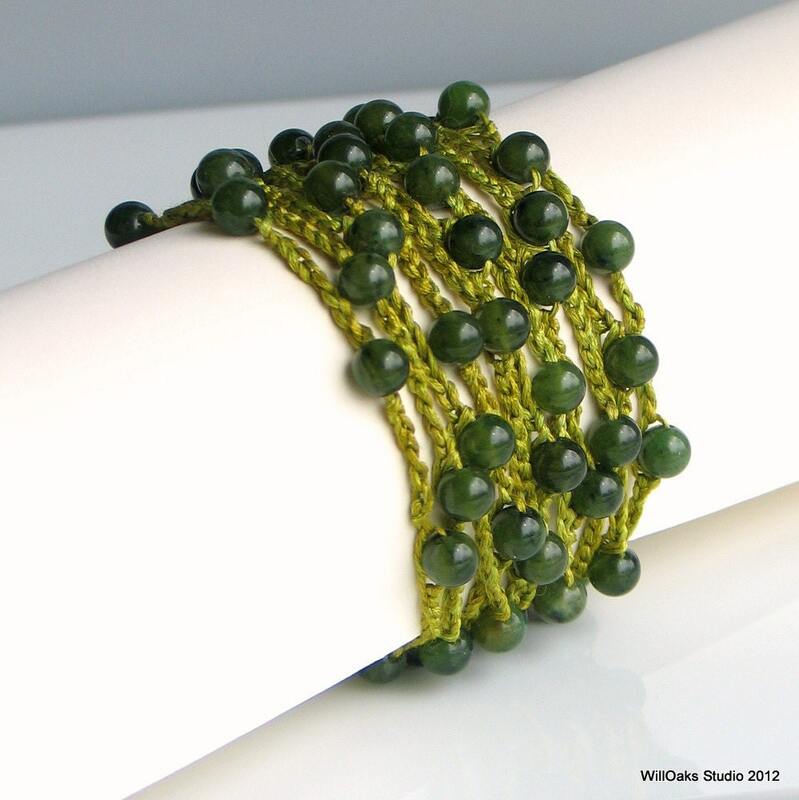 If no size is noted, the general size shown here fits a 6" to 6.5" wrist in a comfy, snug fit. 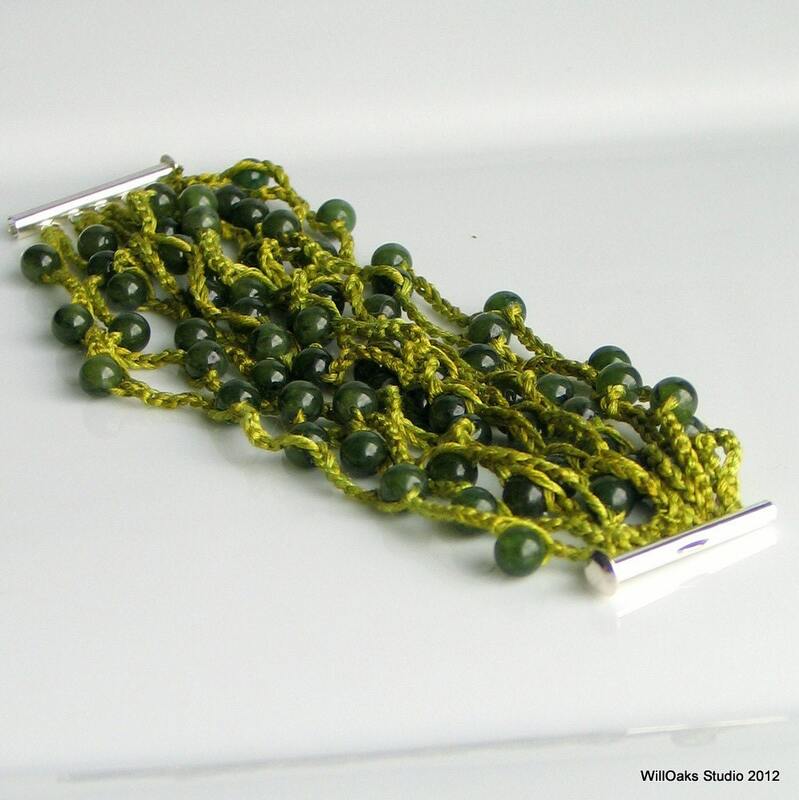 to browse more fresh, original designs.